Snapple is a brand of tea and juice drinks which is owned by Keurig Dr Pepper and based in Plano, Texas. The company (and brand), which was originally known as Unadulterated Food Products, was founded in 1972. The brand achieved some fame due to various pop-culture references including television shows. Snapple was founded by Leonard Marsh, Hyman Golden, and Arnold Greenberg in 1972 Valley Stream, Long Island, New York. Their company, which was originally known as Unadulterated Food Products, was first conceived as a part-time venture to supply fruit juices to health food stores. Unsure if the business would succeed, Greenberg continued to run his health food store in Manhattan's East Village, while Leonard Marsh and his brother-in-law, Hyman Golden, operated a window washing business. In a 1989 interview with Crain's New York Business, Marsh admitted that when they launched the small business he knew "as much about juice as about making an atom bomb." An early apple juice product led to the company's name, Snapple. Golden, Greenberg and Marsh had created a carbonated apple juice. One of the batches of apple juice fermented in the bottle, causing the bottle caps to fly off. The original name of that particular apple juice product, "Snapple," a portmanteau derived from the words "snappy" and "apple," became the new name for their beverage company while attending Lawrence High School. Robin Greenberg had invited her boyfriend Richard Connolly to come over to her modest Valley Stream home, to help come up with a name for the new beverage her father was starting. At the table was Robin, her brother and Arnold her father. Robin's brother was snapping his fingers saying we want it to be a snappy name, Richard asked Arnold "what's it going to taste like" Arnold replied "like Ocean Spray's Cranapple", (which was perhaps the only popular non-carbonated drink at the time") Richard replied "if you leave "apple" in the name it will be successful, as an apple a day keeps the doctor away". Hence the name Snap+apple. The Snapple Beverage Corporation was born, beginning in the early 1980s. Snapple would not manufacture their first tea, lemon tea, until 1987. Currently, there are many different types of Snapple: Tea ( Multiple flavors along with original and diet), juice drinks, lemonade, and bottled water. Snapple is also bottled in the form of an aluminum can. Snapple's brand slogan is "Made from the Best Stuff on Earth." Snapple was known for a popular series of TV advertisements in the early 1990s featuring Wendy Kaufman (the "Snapple Lady") answering letters from Snapple fans. In an effort to counteract the Coke and Pepsi challenge commercials, Snapple began running a new line of advertisements in May 1992, which featured its trademark “made from the best stuff on earth” line in ads that spoofed earlier beer and sports drinks promotions; the ads received low marks from advertising industry observers. In addition, the company used its $15-million-a-year advertising budget to pay for a long-lived series of live radio commercials featuring controversial disk jockeys Howard Stern and Rush Limbaugh. At the end of the summer of 1992, Snapple conducted a five-week search for a new advertising agency that could better convey its corporate identity in preparation for a wider national push. Later that year, Snapple also signed tennis player Jennifer Capriati to endorse its products. By August 1992, Snapple had expanded its distribution to every major city in the United States and it signed new contracts with beverage distributors. The company owned no manufacturing facilities, but instead made agreements with more than 30 bottlers across the country. In this way, Snapple was able to keep its overhead low and its payroll short. The company administration consisted of just 80 employees, 50 of whom worked out of a modest office building on Long Island. Thomas H. Lee, an American businessperson, financier and investor of Thomas H. Lee Partners (THL) acquired Snapple Beverages in 1992 on undisclosed terms. The three founders of Snapple, Leonard Marsh, Hyman Golden and Arnold Greenberg, said they would own about one-third of the new company and be involved in its management. Hellen Berry, vice president of the Beverage Marketing Corporation, a consultant in New York, estimated that Snapple, which had been for sale for more than a year and had $100 million in sales in 1991, sold for $140 million.Only eight months after buying the company, Lee took Snapple Beverages public and in 1994, only two years after the original acquisition, Lee sold the company to Quaker Oats for $1.7 billion. Lee was estimated to have made $900 million for himself and his investors from the sale. The Quaker Oats Company bought Snapple for $1.7 billion in 1994. The company ran into problems and sold it to Triarc in 1997 for $300 million. Triarc sold it to Cadbury Schweppes for $1.45 billion in September 2000. It was spun off in May 2008 to its current owners. Starting in May 2009, Snapple was made with sugar, not high fructose corn syrup. However, in certain areas, the older formula is still sold in stores, but this is becoming increasingly rare. In 2009, a consumer lawsuit was brought against Snapple in California. The suit alleged the drinks contained unhealthy ingredients such as high fructose corn syrup and deceptive names on labels that lead consumers to believe that certain healthy elements are in the drinks that are not really present. In 2010, in a lawsuit against Snapple in the federal District of New Jersey, the court certified to the FDA for an administrative determination the question whether high fructose corn syrup (HFCS) qualifies as a "natural" ingredient. In 2010, the FDA responded by letter and declined to provide the court with the requested guidance. Stating that it would take two to three years to engage in a transparent proceeding to elicit the proper public participation, the FDA again cited its limited resources and more pressing food-safety concerns. In 2011, a New York federal court dismissed a different lawsuit accusing Snapple of misleading consumers by labeling drinks sweetened with high fructose corn syrup as "all natural." The court found that the plaintiffs had failed to show that they were injured as a result of Snapple's labeling. In October 2003, Snapple began its sponsorship of the New York City public school system (and other parcels in the area), as part of the deal to make Snapple New York City's official beverage. The company promised an $8 million per year profit for city schools if it were allowed to sell its drinks, including juice and bottled water, in school vending machines. Snapple was able to acquire the contract in part because New York City officials did not want to encourage the consumption of sodas, which have been linked to childhood obesity, diabetes and are generally considered unhealthy. The Snapple juice drinks, specifically created to meet rules banning soda and other sugary snacks from city schools, are marketed under the "Snapple 100% Juiced!" label. The flavors available under this brand include Green Apple, Fruit Punch, Melon Berry, Grape, Orange Mango, and Strawberry Lime. Although the juice drinks are fortified with vitamins and minerals, a 16-ounce bottle contains more sugar (41 grams) than a 12-ounce can of Coca-Cola (39 grams). Dr. Michael F. Jacobson, the executive director of the Center for Science in the Public Interest, called the drinks "little better than vitamin-fortified sugar water." In addition, the concentrates used in the drinks, apple, grape and pear, are the least expensive and nutritious. Dr. Toni Liquori, associate professor at the Columbia Teachers College, questioned the sale of bottled water in schools, saying "If anything, we should have cold water in our schools." The deal also gave Snapple exclusive rights to sell its tea and juice-based drinks in vending machines on all New York City properties starting in January 2004. Snapple paid the City $106 million for the rights and agreed to spend $60 million more to marketing and promotion over the length of the five-year contract. In the early 1990s the original label graphic on the Iced Tea flavor, a depiction of the United States historical event the Boston Tea Party was replaced due to misinformation espoused by protest groups claiming the ships on the packaging were slave trading vessels in New York Harbor. Snapple also fell victim to a rumor that the small "K" was either a representation of the Klan, or of an imagined "Jewish Tax" (augmented by the fact that all three founders were Jewish). The "K" on the products actually meant that they were certified kosher. Snapple initially tried to quell these rumors quietly, but ultimately had to launch a media campaign to squash them, pointing out it would be bad for business to support controversial issues in such a way as the rumors implied. Through a media campaign with the NAACP, Snapple successfully fought back these rumors, although occasionally they are still brought up as fact. 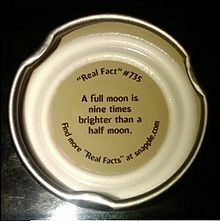 Snapple is well known for printing interesting numbered "List of Snapple Real Fact facts" on the inside of their bottle caps. A list of these "Real Facts" are available on the company website. "Real Fact" #735. Each Snapple cap features a random factoid, some of which have been dismissed as misconceptions. Several of the facts on Snapple caps have been found to be outdated, incorrect or exaggerated. Snapple was the official beverage sponsor of America's Got Talent from season 7 to season 9 of the NBC show. (Howard Stern, one of the judges on the show, was a spokesperson for Snapple in the 1980s.) It was replaced by Dunkin' for season 10; Dunkin' remains sponsor of AGT today. In 2007, Snapple opened the Snapple Theater Center on 50th Street and Broadway in the heart of New York City's Theater District. It has two theaters, one of which is a traditional theater, the other a thrust stage which can house plays. The center also includes a 40×50 ft rehearsal space which is available for rent. The theaters are considered Off-Broadway because of their low seating capacities. The theater has since dropped the "Snapple" name and sponsorship and is purely known as "The Theater Center." ^ a b c d e f g Fox, Margalit (2013-06-23). "Leonard Marsh, a Founder of Snapple, Dies at 80". New York Times. Archived from the original on 2017-09-04. Retrieved 2013-06-15. ^ O'Connor, Anahad. "Hyman Golden, Co-Founder of Snapple, Dies at 85" Archived 2017-09-11 at the Wayback Machine, The New York Times, September 20, 2008. Accessed September 20, 2008. ^ "History". Snapple.com. Archived from the original on 14 May 2013. Retrieved 25 April 2013. ^ "Snapple in Cans". Khaki Blue Bones. Archived from the original on 2 December 2016. Retrieved 2 December 2016. ^ Marks, Peter (4 January 1995). "AT WORK WITH: Wendy Kaufman; Snapple! Cackle! Pop! A Star Is Born". New York Times. Archived from the original on 11 August 2017. ^ "Snapple Beverage Corporation". International Directory of Company Histories. Encyclopedia.com. January 1995. Archived from the original on 20 July 2015. Retrieved 24 April 2013. ^ "COMPANY REPORTS; Quaker Oats to Acquire Snapple". The New York Times. November 3, 1994. Archived from the original on June 11, 2012. Retrieved October 30, 2012. ^ "Quaker Oats Sells Snapple At A $1". Morevalue.com. 1997-03-28. Archived from the original on 2013-01-16. Retrieved 2012-10-22. ^ Brian Graney (2000-09-18). "Triarc Sells Snapple to Cadbury Schweppes [Breakfast With the Fool]". Fool.com. Archived from the original on 2012-03-14. Retrieved 2012-10-22. ^ "Lawsuit Alleges Snapple Drinks Are Not All Natural or Fruity". WiredPRNews.com. 30 March 2009. Archived from the original on 26 September 2014. ^ Goulet, Dawn (30 April 2012). "Confusion in Court over "All Natural" Claims". American Bar Association. Archived from the original on 4 January 2016. Retrieved 29 December 2015. ^ Rubenstein, Abigail (24 January 2011). "Snapple Beats 'All Natural' Label Suit". Law360. Archived from the original on 4 March 2016. Retrieved 29 December 2015. ^ a b c d e f g Burros, Marian (17 September 2003). "The Snapple Deal: How Sweet It Is". New York Times. Archived from the original on 3 September 2014. Retrieved 1 April 2009. ^ Day, Sherri (12 September 2003). "Sizing Up Snapple's Drink Deal With New York City". New York Times. Archived from the original on 27 May 2015. Retrieved 25 April 2013. ^ "Snapple Rumors". Snopes.com. 21 April 2008. Retrieved 12 November 2012. ^ "Snapple Dragoon". Snopes.com. 28 April 2011. Retrieved 25 April 2013. ^ "Real Facts - Snapple". Snapple. Archived from the original on 14 December 2013. Retrieved 6 July 2015. ^ McManus, Matthew (22 November 2011). ""True" Snapple Facts". The FairView. Archived from the original on 11 October 2015. Retrieved 16 August 2012. ^ We Fact-Checked Snapple's 'Real Facts' Archived 2017-02-17 at the Wayback Machine The Atlantic. 11 October 2013. ^ "Fact or Fiction? : People Swallow 8 Spiders a Year While They Sleep". Scientific American. Archived from the original on 2017-08-07. ^ Amos, Jonathan (2003-09-08). "Sound science is quackers". BBC News. Archived from the original on 2006-11-07. Retrieved 2006-11-02. ^ "PUC to mull telephone CLASS proposals". Free Online Library. ^ "MythBusters: Underwater Car Episode Trivia – TV.com". Archived from the original on 2008-02-08. ^ Vanderbilt, Tom (2012-10-04). "The Crisis in American Walking". Slate. Retrieved 2014-12-28. the average American manages only 5,117 steps. ^ "Harriet the turtle dead at age 175". CBC News. 2006-06-23. Archived from the original on 2007-04-01. ^ Lise Brix (2013-11-06). "New record: World's oldest animal is 507 years old". Sciencenordic. Archived from the original on 2013-11-15. Retrieved 2013-11-14. ^ "The Difference between Holland & the Netherlands". CGP Grey. Archived from the original on 6 July 2015. Retrieved 6 July 2015. ^ "keeshond – breed of dog". Encyclopædia Britannica. Archived from the original on 29 August 2014. Retrieved 6 July 2015. ^ Calvin J. Hamilton. "Sun". Archived from the original on 2008-05-23. Retrieved 2008-07-11. ^ The American Southwest. "Badwater, Death Valley National Park". americansouthwest.net. Archived from the original on 1 February 2014. Retrieved 6 July 2015. ^ Dr. Ted M. Montgomery. "Anatomy, Physiology & Pathology of the Human Eye". tedmontgomery.com. Archived from the original on 6 July 2015. Retrieved 6 July 2015. ^ "Clothes Rack". monticello.org. Archived from the original on 6 July 2015. Retrieved 6 July 2015. ^ "Glass Slippers Mistranslations". snopes.com. Retrieved 6 July 2015. ^ "God's Number is 20". cube20.org. Archived from the original on 8 July 2015. Retrieved 6 July 2015. ^ Jesse. "Mississippi Library Commission Reference Blog: Paraguayan Smackdown!". mlcref.blogspot.com. Archived from the original on 15 July 2015. Retrieved 6 July 2015. ^ Mark Winter. "WebElements Periodic Table of the Elements". webelements.com. Archived from the original on 4 January 2014. Retrieved 6 July 2015. ^ "Element 114 is Named Flerovium and Element 116 is Named Livermorium". IUPAC – International Union of Pure and Applied Chemistry. Archived from the original on 2 June 2012. Retrieved 6 July 2015. ^ Lafayette, Jon (13 February 2012). "Snapple Becomes Sponsor of 'America's Got Talent'". Broadcasting & Cable. Broadcastingcable.com. Retrieved 2012-10-22. ^ "Snapple Theater Center -FAQ". Archived from the original on 3 April 2013. Retrieved 24 April 2013. ^ "cRc Kosher Beverage List". Chicago Rabbinical Council. 23 December 2015. Archived from the original on 13 January 2016. Retrieved 29 December 2015.